Hawkshead's cobbled streets and clusters of whitewashed cottages huddled around secluded courtyards give the village a sense of intimacy that is rarely found elsewhere in the Lake District. Narrow passageways with interesting names such as Leather, Rag and Putty Street (now Wordsworth Street) invite exploration, and at every turn there are interesting architectural features – jettied frontages, external stairways, truncated corners and an old spinning gallery or two. 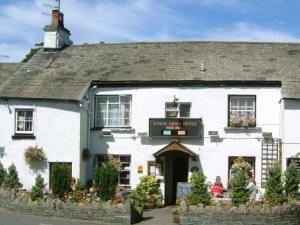 Add a few ancient coaching inns and cosy tea rooms and Hawkshead has everything to spend an unhurried afternoon. The Quaker hamlet of Colthouse has a Meeting House dating from 1688 (still in use) and its own burial ground. To the north is the Baptist community of Hawkshead Hill, with its interesting chapel, cemetery and outdoor baptismal, whilst Methodism is represented with a simple chapel in the heart of Hawkshead. The tranquil lake of Esthwaite Water, fringed by lush meadows and overlooked by the seemingly endless wooded slopes of Grizedale and Claife Heights, is noted for its trout fishery. 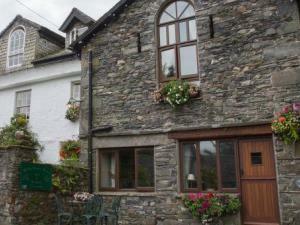 At its southern end lie the twin villages of Far and Near Sawrey; the latter famously associated with Beatrix Potter’s house at Hill Top, where she wrote and illustrated several of her famous books. 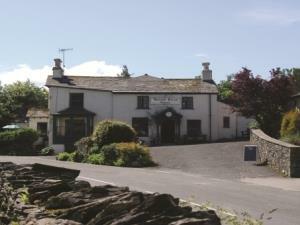 Hawkshead and the surrounding areas have many different attractions. From the Beatrix Potter Gallery & Hill Top house to swinging through the trees with GoApe at Grizedale. 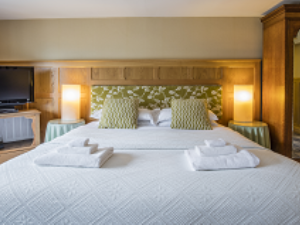 There is sure to be something for everyone at Hawkshead during your stay. There are a variety of events taking place in and around the Hawkshead area. From arts and culture exhibitions to discovering the wonderful world of Beatrix Potter, check out what is on during your visit and browse the events of most interest to you. Hawkshead village is a beautiful setting for a rich variety of cosy, old-world charm, tearooms, offering delicious homemade cakes and the traditional English cream tea, all served up with a friendly smile. And it’s not just about the food, there’s an array of leaved teas to choose from, along with a choice of filter coffees. In the heart of the village you will find several characterful, ancient-beamed, 17th Century Inns with roaring log fires, offering you a warm welcome with only the best of locally sourced food for you to try. How about delicious Cumbrian Beef, polished off with a slice of Orange Cointreau Cheesecake! The menus offer great value for money and you’re always guaranteed a friendly welcome, whether it’s in the bar or in one of the restaurants. Wherever you choose out of the pubs and restaurants of Hawkshead, you will always be guaranteed the very highest standard of food and an excellent standard of service. We mustn’t forget, there are also some great pubs on the fringes of Hawkshead, particularly the Lake District’s original gastro pub at Barngates, with its rustic chic, beamed bar and a menu to tempt the fussiest of eaters. Just a small tip, before you leave delightful Hawkshead, take a jar of relish home with you. They make the very finest selection of relishes here and it makes a tasty gift. 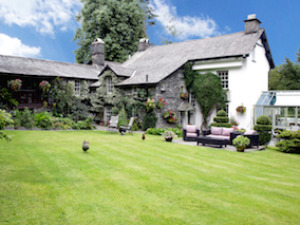 Beatrix Potter was particularly fond of the Hawkshead area having spent holidays here with her parents. In 1905 she bought Hill Top Farm at Near Sawrey out of the proceeds from her recently published book, The Tale of Peter Rabbit. The extensive conifer plantations and woodlands of Grizedale are an amenity for a whole raft of activities. Have a go at orienteering, cycle along miles of woodland tracks, follow the sculpture trails or learn more about the forest and its inhabitants on a guided walk with a forest ranger. In the 12th century, Hawkshead and most of the surrounding land was a monastic grange run by the monks of Furness Abbey as a sheep ‘walk', with much of the surrounding woodland cleared to make way for pasture fields. The dominant breed was the Herdwick, a sturdy sheep, well suited to the cooler and wetter climate of the Lake District. It was the coarse grey fleece of this sheep that provided the abbey with a great deal of its wealth. Local weavers would produce cloth from the spun wool, which was washed and hung on tenterframes to be stretched back into shape; local place names such as Tenter Hill (SD 338 997) are indicative of this former activity. The cloths were taken to Kendal to be finished and turned into hardwearing garments for the working classes. Hawkshead Hall was the administrative centre for this northern outpost of the Abbey's estate. Here the monks would receive tithes, collect wool and despatch it for spinning and weaving and sell on the woven pieces of cloth. The trade in woollen goods was highly profitable for the monks, providing over a quarter of the Abbey's entire income. In earlier times it was the custom to call for a rowing boat when one was required. One stormy night a call was answered by a ferryman who rowed across the lake to Bowness only to return in a state of shock. The next morning he developed a rapid fever and died. Thereafter, on stormy nights whenever there were strange calls for a boat from Ferry Nab, no-one would dare go. Eventually a priest exorcised the Crier of Claife to a quarry on Claife Heights, but occasionally the ghostly calls for a boat can still be heard. High Wray was the scene of a series of murders in 1672, all carried out by one man; Thomas Lancaster. Thomas wanted to marry a local girl from High Wray who was already betrothed to someone else so he bribed her father to allow him to marry her instead; an event which took place on 1 Jan 1672. An imposing mock Gothic castle built by James Dawson in the 1840s using money from his wife's inheritance. Beatrix Potter stayed here in 1882 whilst on holiday with her parents. Grounds open all year round. William Wordsworth came here in 1779. His mother had recently died and he and his brother Richard were sent to Hawkshead Grammar School to finish their schooling. Both boys lodged in the village with Ann Tyson, a local widow (and later at Colthouse when Mrs Tyson moved there). His adolescent experience of the natural world around Hawkshead had a lasting effect, and was recalled in his poetry of later years. Beatrix Potter’s traditional Lakeland farm at Hill Top, was a special place for Beatrix, where many of her animal characters from her books were set in the house and garden and surrounding landscape. In earlier times it was the custom to call for a rowing boat when one was required. One stormy night, a call was answered by a ferryman who rowed across the lake to Bowness only to return in a state of shock. The next morning he developed a rapid fever and died. Thereafter, on stormy nights whenever there were strange calls for a boat from Ferry Nab, no-one would dare go. Eventually a priest exorcised the Crier of Claife to a quarry on Claife Heights, but occasionally the ghostly calls for a boat can still be heard. High Wray was the scene of a series of murders in 1672, all carried out by one man – Thomas Lancaster. Thomas wanted to marry a local girl from High Wray who was already betrothed to someone else, so he bribed her father to allow him to marry her instead; an event which took place on 1 Jan 1672. Shortly afterwards, Lancaster poisoned his wife, her father, her three sisters, her former fiancé, her aunt and a servant, and to make it look like a local epidemic, went on to poison some of his neighbours. At his trial he was found guilty and sentenced to death. He was hung from his own front door at High Wray Farm. The Drunken Duck Inn apparently received its name after beer accidentally drained into a ditch that the local ducks frequented. The ducks lapped up the alcohol and passed into a lifeless stupor. The landlady, thinking they were dead, set about plucking them ready for the oven but soon realised what had happened. The ducks were reprieved from being roasted and given knitted jerseys and kilts to wear until their feathers grew back.